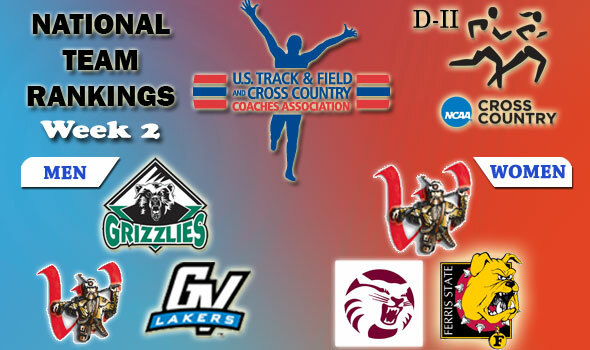 NEW ORLEANS – On Wednesday, the U.S. Track & Field and Cross Country Coaches Association (USTFCCCA) released its week two national team rankings for the 2011 NCAA Division II cross country season. The top five men’s and the top nine women’s teams remain unchanged from a week ago, but 17 men’s teams and 15 women’s ranked teams will be in action this weekend which could usher in a hefty change to the rankings in the coming weeks. — The top five spots in the men’s rankings are unchanged from last week’s release. — At No. 10, Central Missouri cracked the top ten for the first time this season. — New to the top 25 this season are No. 12 Minnesota State and No. 14 Eastern New Mexico. — The RMAC is still the top conference with four teams in the top 25, followed by the GNAC, Northeast-10, and PSAC with three apiece. — No. 1 Adams State and No. 2 Western State are slated to do battle at the Cowboy Jamboree hosted by Oklahoma State this weekend, but both also lists Colorado’s Rocky Mountain Shootout on the schedule for possible split-squad action … No. 3 Grand Valley State will visit the Notre Dame Invitational … No. 6 Southern Indiana along with No. 16 Queens (N.C.) and No. 17 Bellarmine are schedule to run at the Greater Louisville Classic this weekend. — The top nine spots in the men’s rankings are unchanged from last week’s release. — At No. 10, U-Mary cracked the top ten for the first time this season. — New to the top 25 this season are No. 23 UC San Diego, No. 24 Mansfield, and No. 25 Colorado Mines. — The PSAC now leads all conferences with four squads in the top 25, followed by the RMAC, MIAA, and CCAA with three apiece.